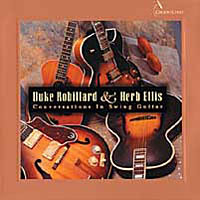 Duke and Herb Ellis' classic "Conversations in Swing Guitar" album now available on 180 gram virgin vinyl with bonus 12" 45 RPM single of 2 tracks from Volume Two. Experience the warmth and superior sonic scope of 180 gram vinyl with this highly regarded guitar extravaganza! Both discs $30.00 while they last. Duke's next release will also be available on vinyl.